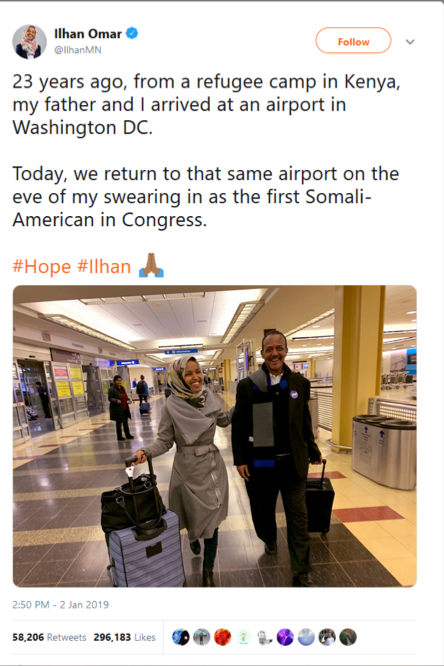 According to her campaign website, Rep. Omar and her family fled their native Somalia’s civil war when she was 8; spent 4 years in a refugee camp in Kenya; and came to the U.S. as refugees, settling in Minnesota. I don’t know the specifics of Rep. Omar’s resettlement, but having worked for an organization that resettles refugees, I’m aware of the great needs that refugees have when they arrive in our country. Depending on the situation, they need help learning English, accessing medical services, applying for a social security card, receiving job training and finding a job, enrolling their kids in school, and so many more. Organizations like mine come alongside refugees to assist them with needed services and to help them with their adjustment, but our services only last a short time. A few months after their arrival, refugees are expected to be self-sufficient and, in most cases, they are. Like all immigrants, they work; they go to school; they raise families, giving themselves fully to their adopted country. They receive the gifts of welcome and compassion, and they give the gifts of their work, their talents, their entrepreneurial spirit, and also their faith. They give, and they receive. They bestow a blessing, and they receive a blessing--that’s the beautiful mutuality of welcoming policies for immigrants. This mutuality reminds me of the immigrant Ruth’s story in the Hebrew Scriptures. © 2018 Karen Gonzalez. All rights reserved.